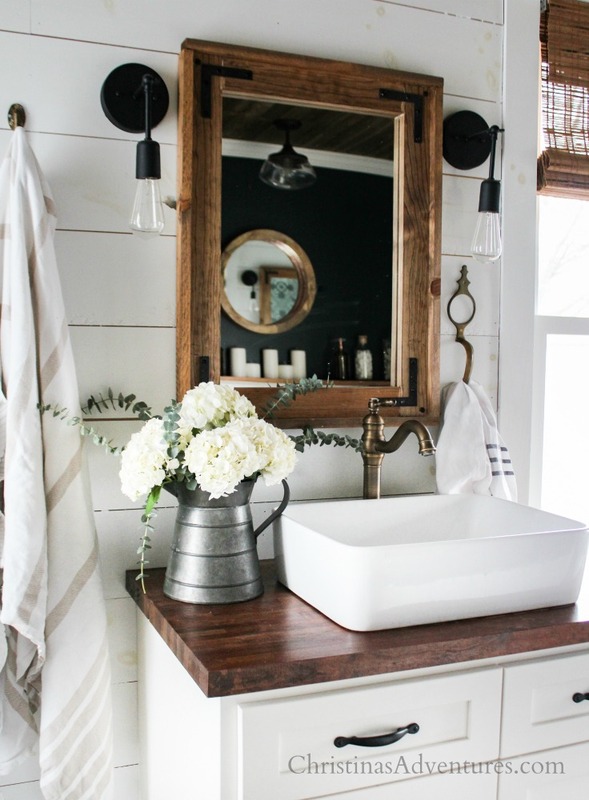 Come on in and tour this vintage inspired farmhouse bathroom decor for spring and summer. 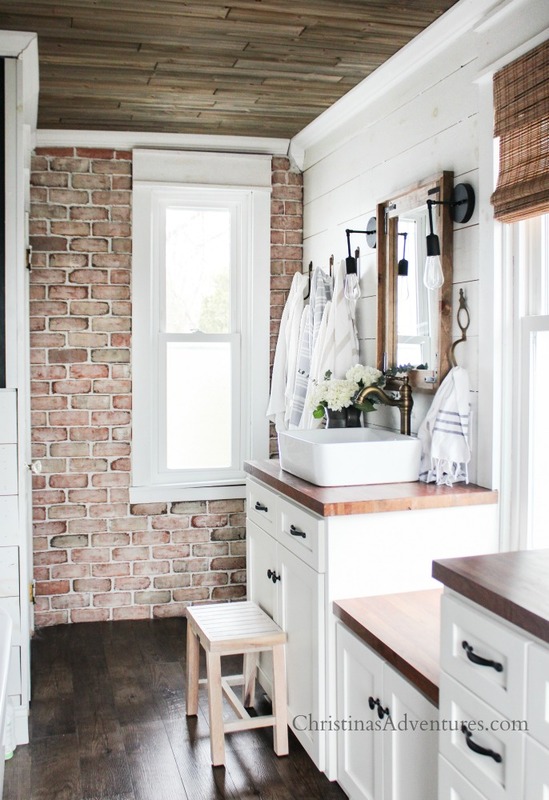 Filled with rustic elements, wood tones, shiplap, brick, and mixed metals. Affiliate links included – full disclosure here. Is it weird to decorate a bathroom? We’re friends. It’s OK. You can tell me that it’s weird. But guess what? 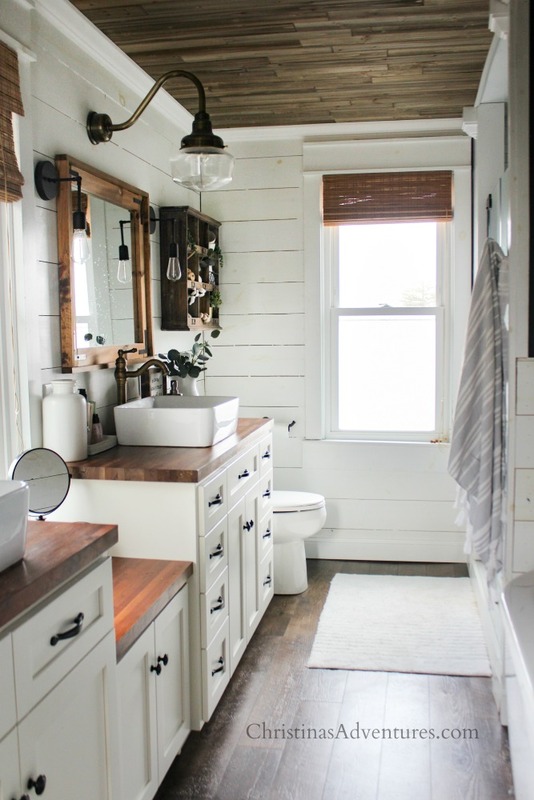 After alllll of the hard work we put into this bathroom renovation last year…I don’t even care! If you follow along on Instagram, you’ve seen that this DIY wood mirror frame has been a HIT. It has been so much fun for me to see other people using my tutorial to make their own mirror frames for their own spaces. It seriously makes me the happiest! I’ve also been getting a LOT of questions about how our butcher block countertops are holding up. You can see them in these pictures – they’re holding up really well! I honestly couldn’t be happier with them. 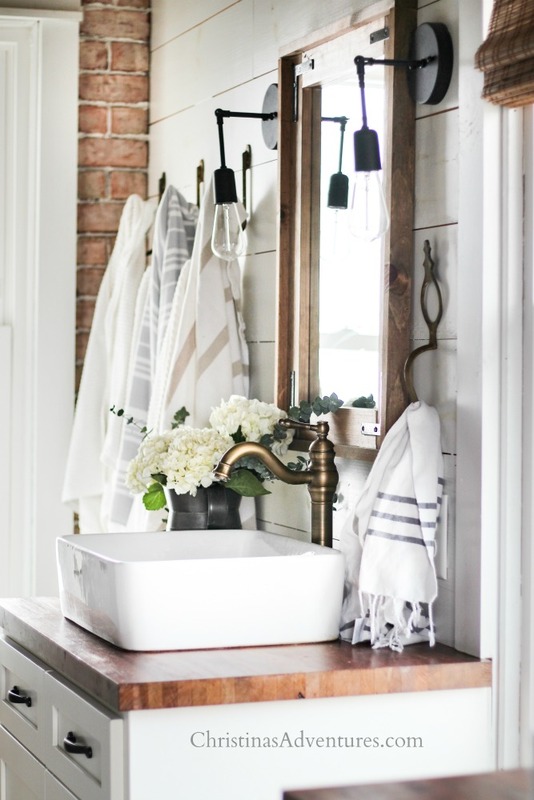 They were a great budget friendly option for us, and they add so much warmth and character to our bathroom decor. In case you missed the specifics, they’re butcher block countertops we ordered from Lumber Liquidators and they’re stained with this color (it’s the same stain we used on our mirror frames too). Then we finished them off with four thin coats of Polycrylic (which is much better than polyurethane because it won’t yellow over time). And have you seen how much better this view has gotten in the past few months? 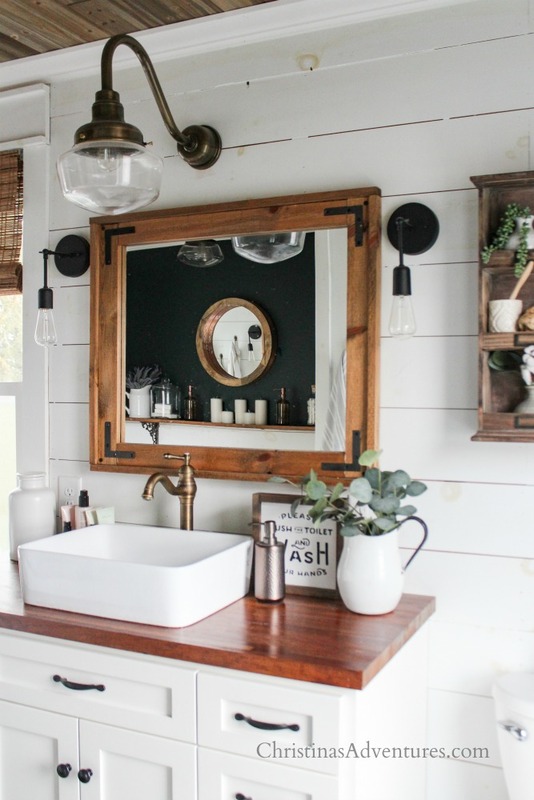 I shared how we faked our old trim in this post (it’s a SERIOUSLY easy hack that’s very budget friendly). It works well on an old house with existing old trim, or on a new build to add some character to builder grade molding. 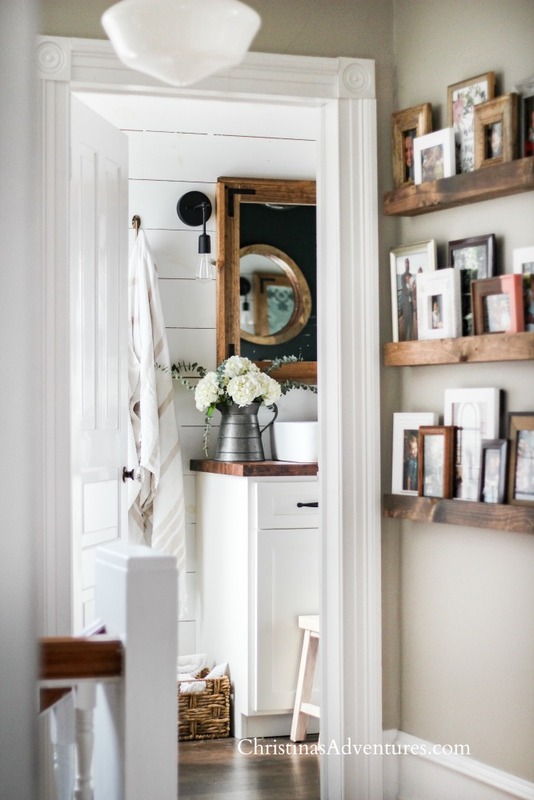 We also made these VERY simple picture shelf ledges and they’ve been such a sweet spot in our home! Finally – the other question I get asked all. the. time. is about our bamboo blinds. We love them and are so happy with them (especially for the price point!). I ordered them in the Dali Tuscan color, which looks a lot more yellow online than it does in person. I’ll be honest and say that these probably aren’t a “forever piece”, but man I love them. They’re also not huge on privacy since they’re not lined, so take that into consideration when purchasing. And a few people have asked about how our shower tiles are holding up – and the answer is I LOVE them! 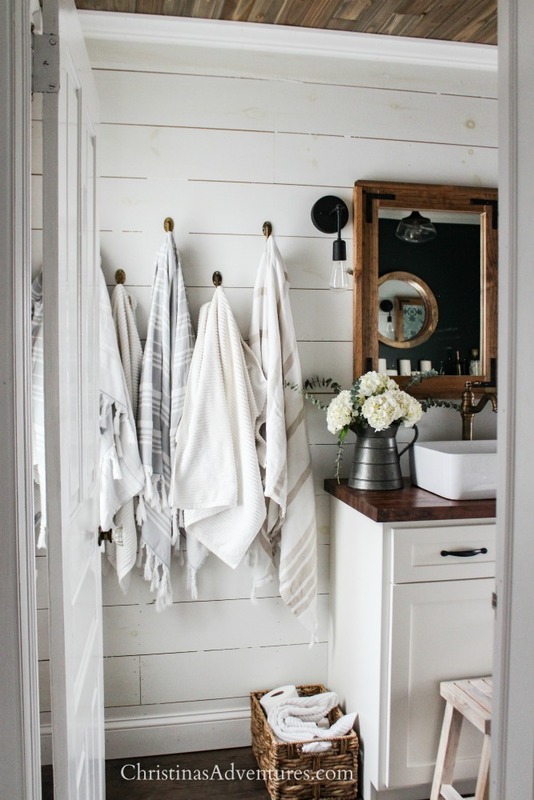 Especially that accent tile – we’re so happy with how they complete our bathroom design. You can read all about where to get the best deals and shop for the specific tiles we used in this post. 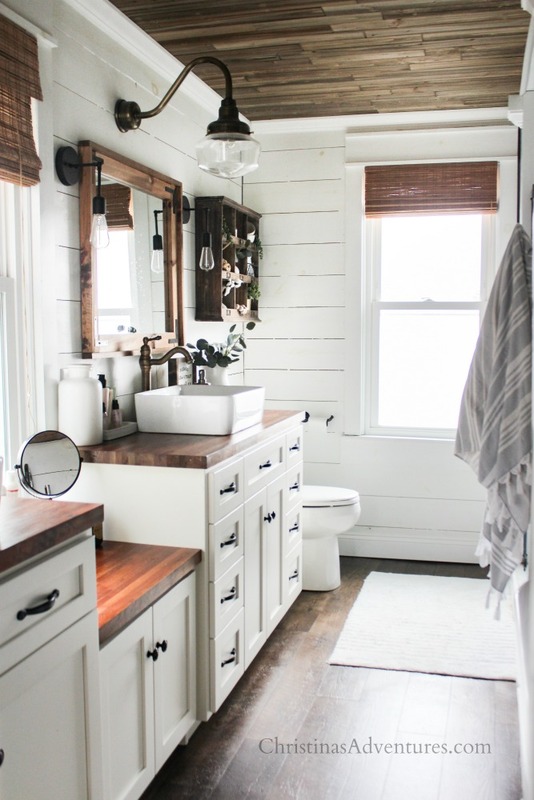 I absoulety love this bathroom! I do have one question on your bathroom vanity. Is the small section between the 2 cabinet specifically used for something. Or was it just meant to give character and dimension to the cabinet. Either way I love it! Is the brick in the bathroom real brick?